It’s been less than a month since Gary Vaynerchuk (aka @Garyvee) launched a new product (or rather relaunched one, his wine review site Corkd). To make up for his slacking, the wine marketing impresario and author is launching two new Websites this week: Cinderella Wine and Gourmet Library. With Cinderella Wine, which launches tonight at midnight, you sign up and join a shopping club of sorts like Gilt, except it’s for wine. You receive deal updates via email, or you can also follow Cinderella Wine on Twitter. “What makes this sick,” says GaryVee, “is the wine is gonna be top top notch and the price is gonna be scary low. We even link to wine-searcher.com to prove how sick the price is.” He calls it “Cindy Wine.” So prissy. But the prices he shared do look sick. For instance a Fontanafredda La Villa Barolo 2001, which goes for $109 a bottle at Wine.com, will be available at Cindy Wine for $44.44. That’s definitely going to sell out. The second site is an online gourmet store for cheese, chocolate, pastas and olive oils, with conversational videos marketing many of the products. It is targeted straight at foodies, and supposedly offers discounted prices as well on items such as fancy olive oil, fresh pappardelle pasta ($2.99), and D’Artganan Quail Eggs ($5.99), although I’m not sure you’d want to ship the quail eggs. Gourmet Library is a natural extension of GaryVee’s original Wine Library wine business, from which Wine Library TV (and his career as an online video blogger) sprang. The videos on Gourmet Library are informative but not quite as entertaining because GaryVee himself doesn’t do them. 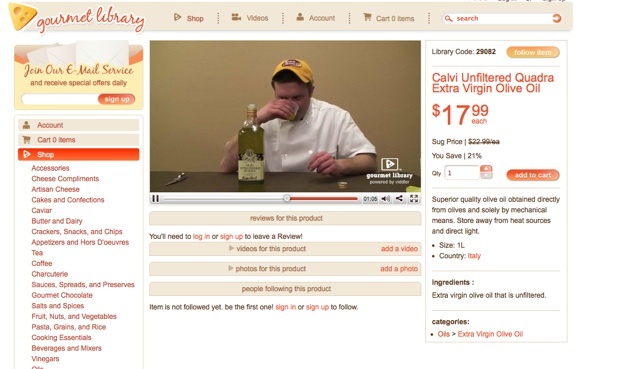 Instead, it features some of his staff who work at the Wine Library store in New Jersey, like this one showing a guy tasting olive oil from a plastic cup. It’s just not the same as GaryVee waxing on about which wines go best with Cap’n Crunch cereal.